I've discovered the secret to radiant skin. It's not facials (though they help), it's not slathering on a bunch of different night creams and day creams (though I still will). No, it's the Orlane Paris Absolute Radiance Lightbox. This beautifully packaged box is packed with a three-step process that results in skin that glows, gleams and otherwise glistens. Seriously, after only one application I already noticed a vast difference in how youthful my skin appeared -- and, as if that weren't enough, was asked my age (as in, "you look so young! How old are you?") so many times I lost count. If that isn't the highest compliment a woman can receive, what is? You start with the Dazzling Eyes Ritual. This includes Eye Contour Serum and Under-Eye Patches. Begin by squeezing a dab of the serum onto the skin below your eyes, then add the patches -- saturated gauzy-like white contraptions -- and keep them in place for seven minutes. While they're sinking into your skin, mix up the Shimmering Mask -- the combination of a powder and a creamy emulsion -- that, after removing the patches, you'll rub into your skin and leave for five minutes. After a quick rinse, finish with the Evanescent Cream -- a rich daily moisturizer that sinks into your skin without feeling greasy, thick or heavy. The result? Unbelievably clear skin that's so glowing, so radiant, you'll be shocked at how quickly it could be achieved. Now, what's in each product that gives you that result? The serum includes vegeceryl (a plasma that nourishes the skin), in addition to sugars and plant extracts to decongest and detoxify the skin. Combined with the patches, your eyes give off the appearance of a full eight hours sleep even if you've only had four -- and trust me, I tried the theory and was shocked at how rested I appeared! No dark circles, no wrinkles, no unsightly lines to be had. It was truly a miracle. The mask contains cicer arietinum grain extract to stimulate creatine kinerase. This is responsible for producing energy from phosphocreatine to exfoliate the skin and remove it of dead skin cells. The concoction is slightly foamy but sinks into the skin like a moisturizer -- so none of that horrible hardness or tightness you get from some masks. It works to nourish and hydrate the skin so it gives off a lively, revitalized appearance. Finally, the moisturizer oxygenates the tissues, erases fine lines and plumps up the skin. It contains white lupine grain extract to promote microcirculation, cicer arietinum grain extract to revitalize the skin, and 3D Flash, Orlane's innovative complex that transports oxygen within the cells and recovers C02. You'll be left with illuminated, shimmering, silky smooth skin in just seconds! Each Lightbox comes with six full sets of applications. And while this may not seem like a lot, you can actually stretch it out over quite an extended period of time. Rather than using them six days in a row, you can use one a week -- that's a month and a half of glow time! 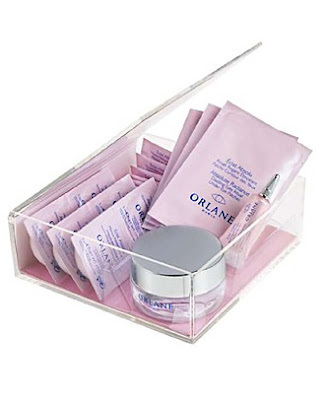 The Orlane Paris Absolute Radiance Lightbox retails for $200. Thanks for posting...we always need new ideas for anti-aging...but at $200 a pop, that is not on most women's shopping lists nowadays! Do cheaper yet effective anti-aging products exist? Sounds amazing, I'd love to try it. Now tell me where I can I get it, I'm in Toronto, Ontario.